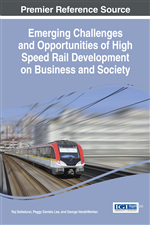 As we witness the advancement of U.S. high-speed rail initiatives, the country can look towards its European and Asian counterparts for best practices and lessons learned from their decades of high-speed rail design and operations. These experiences gained may be applicable towards projects such as the Texas Central Railway and the California High-Speed Rail Project. This chapter will address the events of 2009 that have brought domestic high-speed rail to the forefront of U.S. rail transportation. This includes the new FRA Tier I and proposed Tier III criteria, challenges associated with each FRA tier of operation, overseas interoperability efforts, snapshots of international experiences (from policy and technological perspectives), the holistic system-based approach to safety, ongoing efforts of the FRA Engineering Task Force, and additional challenges and opportunities moving forward. Regardless of operating speed, it is essential that trains are safely and reliably operated if train travel is to be a preferred mode of transportation. With its rich rail history, the U.S. has had substantial experience in developing and enforcing safety requirements for passenger rail equipment and systems. Title 49, Parts 200-299 of the Code of Federal Regulations (CFR) identifies criteria established by the Federal Railroad Administration (FRA) to govern the design and operation of passenger and freight rail rolling stock. However, these criteria are only applicable for equipment that operate up to 125 mph (201 km/h), also known as Tier I operation, or 150 mph (241 km/h), also known as Tier II operation. To date, there are no established U.S. regulations or standards that address design of rail equipment to operate at speeds greater than 150 mph (241 km/h). To facilitate introduction of service at speeds greater than 150 mph (241 km/h), the U.S. has looked to its overseas counterparts for best practices from their decades of experience with the design, manufacture, operation, and maintenance of high-speed rail (HSR) equipment and systems. The information gathered though interaction with HSR industry experts will aid the development and subsequent growth of HSR policies and technologies in the U.S. This chapter provides insight into the challenges faced when introducing new HSR technologies and associated design and construction techniques, along with the challenges of complying with current U.S. regulations. These issues are being overcome as the domestic rail industry looks to international high-speed railroads, and applies the lessons learned by those who have been successfully providing safe, reliable, and efficient HSR service.